The RFP required that we identify eight key personnel. We won this work (with a brand new customer in a whole new industry) writing to those leaders and their experience. In order to start working on the contract in exactly 90 days, we’d have to recruit more than 80 individual contributors. The first few days were consumed with reaching out to incumbents to see who we could sway over to our team. We got 10. With a need of nearly 90, we got 10! What we had learned and learned quickly was that the incumbent had massive under-performance issues and a less-than-happy customer. A Career Invitational was planned tout suite! We conducted on-site resume review, in-person interviews and meet-and-greets to introduce those we were interested in hiring, with our senior level executives. At the end of the day, and roughly two weeks later, we had closed 27 new hires – getting us exactly half-way to where we needed to be. With just eight weeks left, we still needed 45 candidates to recruit onto our team. More than half of them needed valid security clearances and at least 3 years of demonstrated experience. The small-town location threatened the talent marketplace as most viable candidates either already had highly coveted roles or were already hired on with us. 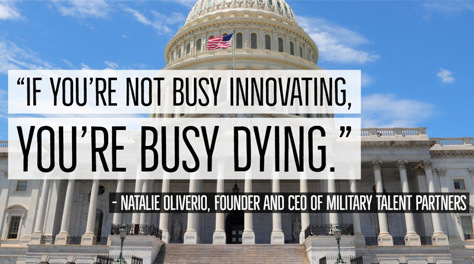 As the GovCon space knows better than most, if you’re not busy innovating, you’re busy dying. Falling on the sword wasn’t on anyone’s mind, so we hustled up and sought out a strategic partnership that would prove its weight in gold. We needed access to a large group of talent. Candidates who would be likely to have clearances, or be clear-able. Talent that could execute a swift relocation to our customer’s site and be able to acclimate to the contract requirements. On any other day, this would seem impossible with the time we had to make it happen – but lucky for us, we found our IN with military talent. Veterans are the heroes who have always defended and protected our country. With no surprise, they were the heroes to our successful contract implementation too. It was a Wednesday afternoon when a collective breath exhaled across the company. There were two business days left before our Monday morning start on this massive contract win. Our 90th offer letter was signed and we were officially a small-business startup no more. Military talent is mission-focused and committed to results. The soft-skills and multi-dimensional experience they bring is unparalleled in the talent marketplace. Tapping into the right partnership organization is crucial to the successful recruitment of veterans, transitioning military and military spouses. The potential is limitless in this dynamic group and will relentlessly diversify your business.